Toast the first zero-gravity wedding, explore Manhattan's travel grid, and can you ever have too many David Sedaris readings? 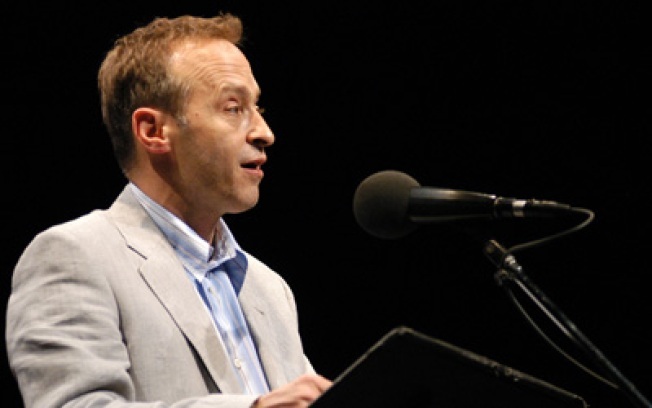 Author David Sedaris reads at Strand Books tonight. DRY WIT: David Sedaris reads from his most recent bestseller When You Are Engulfed in Flames at Strand Books. You listen, get his autograph, and start wondering if anyone would buy 250-odd pages of free-association about your family and terrible jobs. (Probably not.) 6PM. WE GOT FLOATERS: Space-obsessed Williamsburg twosome Noah Fulmor and Erin Finnegan are planning to be the first couple to marry in zero gravity, and the theme extends to every detail. (The dress? Designed specifically in Japan for zero gravity conditions. The rings? Crafted from a meteorite.) The big day's not 'til June 20, but they're throwing a party at L.E.S. lounge Kush to ramp up the festivities. It's at times like this we really love New York. 7:30PM. MOLE PEOPLE: Despite the organizers' insistence that the Adult Education Series is useless, we always come away having learned something. This latest installment, Urban Travel, is designed to give you an inside look at getting around NYC's grid -- experts discuss utopian subway systems, quirky transportation sites, and riders who don't give up their seat to that guy in crutches. Union Hall, 8PM.